After 30 years, Joanne Kutter sells Kutter Harley-Davidson of Janesville and Monroe, Wisconsin to Sara Pomeroy with the help of auto dealership broker, Performance Brokerage Services. 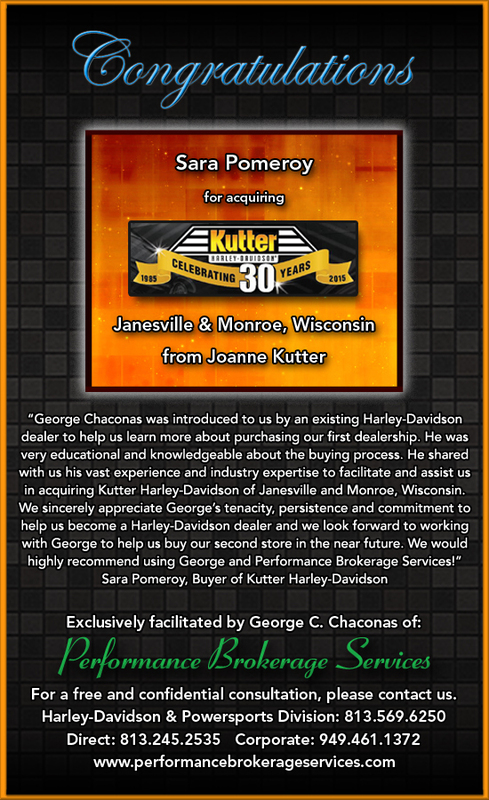 Harley-Davidson and new car dealership broker, George Chaconas of Performance Brokerage Services is pleased to announce the sale of Kutter Harley-Davidson in Janesville, Wisconsin from Joanne Kutter to Sara Pomeroy. Read the Official Press Release.